Riddick. Is that the only title this movie is going to get? We've been waiting to see some official marketing, or even a release date yet, for Vin Diesel's new sci-fi sequel Riddick, directed by franchise filmmaker David Twohy. They film got an R rating earlier this month, which is good news at least, but beyond that we've only seen a few official photos released so far. The guys at CineHeroes have found and posted the first French teaser poster for Riddick, featuring Vin Diesel in a badass sci-fi stance, which is actually just a Photoshop of an earlier promo photo (via RopeofSilicon). Still, cool to see. I like the dark, sci-fi epicness of the design. Here's the French poster, as debuted by CineHeroes. 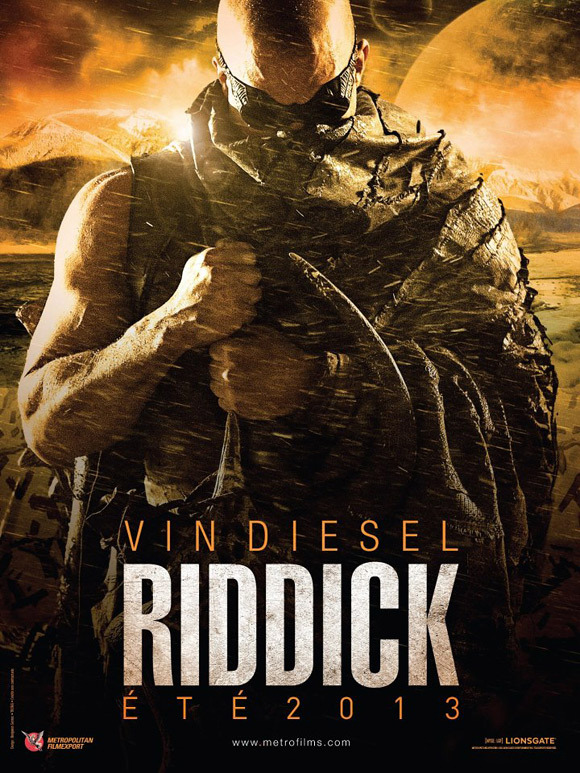 I hope we see more great marketing for Riddick soon. Pitch Black and Chronicles of Riddick director David Twohy returns to write and direct the sequel Riddick starring Vin Diesel. Betrayed by his own kind and left for dead on a desolate planet, Riddick fights for survival against alien predators and becomes more powerful and dangerous than ever before. Soon bounty hunters from throughout the galaxy descend on Riddick only to find themselves pawns in his greater scheme for revenge. With his enemies right where he wants them, Riddick unleashes a vicious attack of vengeance before returning to his home planet of Furya to save it from destruction. The new Riddick will hit French theaters Summer 2013, but Universal has not set an official US date yet, but we expect one soon. Stay tuned. The logo is easily three times the size of his name. And since his name is associated with that title, it's not surprising it's one of the first things you'll read. Pitch Black and Chronicles of Riddick were so different - I'm not sure what to expect here. But I don't think that I want to see it. Based off the plot synopsis and the R rating, Im guessing this is the Riddick film all fans have been waiting for. Riddick at his full badass potential fully stocked with Shivs and sneakyness! That would be outstanding. I enjoyed Pitch Black so much because it had a simple but creative premise. I was put off by CoR because they expanded it so dramatically. Had it been a standalone film, I may have appreciated it more. If this ends up looking promising enough, I might just have to watch the second one repeatedly enough so that it's all drilled into my head. i really liked PB too - those creatures were freaking me out! Cannot wait! Been waiting for this for a long time. lol - indeed. Hope they do a nice teaser. lol - made that comment 5 months ago?! rofl - I feel u brotha! Yes I want to go see this!